Yoshiko Carlton, native of Kagoshima, Japan, started her Koto training at nine years of age from Ms. Keida who resides in Kagoshima Prefecture, Japan today. She continued her Koto studies after she moved to Florida where she took lessons from Mrs. Kyoto Okamoto, a founder of Washington Toho Koto Society which is based in Washington, D.C. She furthered her development by then studying under world renowned 25 stringed Koto player, Brian Yamakoshi. 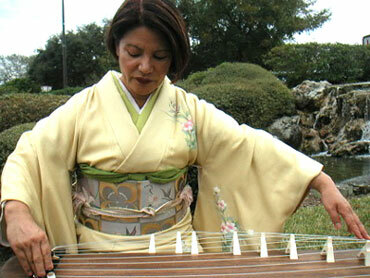 Her passion for Koto and her powerful performances are known throughout Florida. To educate the community about the beauty and history of Koto Yoshiko often gives lectures and demonstrations at schools and museums, including the Morikami Museum and Japanese Gardens in Delray Beach. In 2003, she was awarded a certificate of recognition by the Consulate General of Japan in Miami for her contribution in promoting Japanese culture, especially Koto, to the community. In 1995 Yoshiko established the South Florida Branch of the Washington Toho Koto Society then in 2002 she established Friends of Koto mainly in Orlando where she started teach children and adults the art of Koto. Being away from Japan allows her more freedom to enjoy playing Koto with other instruments other than what is traditional. Yoshiko is a founding member of Fushu Daiko Japanese Taiko Drumming where she combines Koto with Taiko to create a unique combination of power and elegance. Also she regularly performs with Jorge Alfano, who is known for the mastery of a wide range of world instruments. With Jorge, Yoshiko plays a variety of music that includes traditional Japanese music with Koto and Shakuhachi, bamboo flutes, meditational and new age music. In addition, you can also find Yoshiko performing along side, award winning Jazz musician, Tom Toyama.